I bought this translation while I was in Norwich last summer. It is published by the Friends of Julian, has a forward by Robert Llewelyn, and is translated by Sheila Upjohn. It is arranged as daily readings, with most chapters set out over two or three days. I really wanted to like this translation very much, but in the end was a bit disappointed by it. My first experience of Julian’s writing was the small Enfolded in Love book, and I have always loved the way the words flowed. For a long time I didn’t realise that it was Sheila Upjohn who had done the translation, I was more aware of the fact that Robert Llewelyn had been the editor of that and the other books in the series. When I found out that there was a longer translation available I was excited to read it, and I must say that the translation itself is wonderful, but there are other things which don’t work for me. First of all, this is not a complete translation. Most of the text is here, but it is not all here, and unfortunately for me, some of my favourite passages have been omitted, so as I read I was very aware that some things were missing. Like the Grace Warrack translation, this is quite a sparse version, with no footnotes and no headings. The chapter numbers are printed at the bottom of the page, but that is all. I usually read two chapters of Julian every evening, and so this format didn’t really work for me, I suppose because I was not using it in the way it was intended. In the end I had very mixed feelings about this book, but in large part I think this is due to the way I read Julian and the structure of the book being incompatible. The translation is wonderful, and if you are looking for a structured text for daily meditation, maybe a step on from Enfolded in Love, then this might be the translation for you. However, if you are familiar with the full text then this will seem a little lacking, and if you read it in any way other than the one for which it was intended then it will feel a little disjointed. 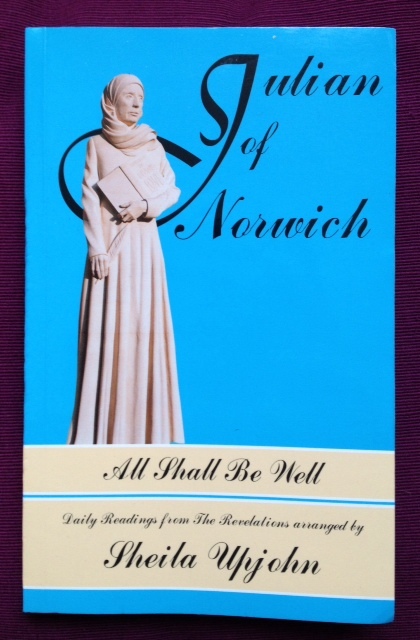 This entry was posted in Editions of Julian's writing, Julian of Norwich and tagged Enfolded In Love, Friends Of Julian, Julian of Norwich, Revelations Of Divine Love, Robert Llewelyn, Sheila Upjohn by tokyopurplegirl. Bookmark the permalink.